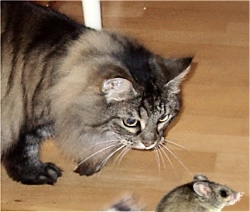 Know Your Cat - Why do cats catch mice? Cats kill mice. It has always been so, even in the distant past when cats and humans got together through the discovery that they could both improve their diets by keeping grain stores mouse-free. And in modern cartoon shows like 'Tom and Jerry' cats and mice continue the eternal struggle between hunter and prey. Your cat might bat a catnip mouse about the carpet to keep you happy, but make no mistake - the cat's instincts crave the real thing. Of course, for a feral cat mice are not the only food source on the menu. A cat living wild can't afford to be fussy; so other rodents, birds and even rabbits are fair game. But mice are easy prey for a cat. They are small which limits the possibility of counterattack (the expression 'fight like a cornered rat' is based on reality) and unlike birds, mice can't escape by flying off. So it is not surprising that cats like to hunt mice. For a cat hunting is a survival instinct. Unlike most other animals (including dogs), cats' bodies do not produce much taurine. Taurine is an essential amino-acid - one of the building blocks of proteins. Without taurine, no animal can survive for long, so cats make up for their taurine deficiency through their diet. Since only meat provides enough taurine to keep a cat going, your cat is what biologists call an 'obligatory carnivore'. It is important to remember that although dogs can survive well on a vegetarian diet, cats can not. They literally have to kill to live. (Or sub-contract the job to humans, which is basically the same thing). Cats are born hunters. Even at four to six weeks kittens start stalking and pouncing on the contents of their food bowl. Later, the twitching tail of the kittens' mother becomes a surrogate mouse. Hunting skills are refined under careful supervision of the mother. The kitten watches and imitates the mother and siblings, and the mother will bring the kittens live prey for practice. This is why wild and feral cats generally kill their prey with a swift bite to the neck, but kittens who never learn this skill from their mothers 'play' with their prey when older, but fail to make a clean kill. (There are also other reasons for the 'play', as explained below.) The mother's role as personal trainer is also one reason why a mature cat may bring her humans a live mouse as a hint that their hunting skills are below par. But learning merely refines what is a natural part of the kitten's instincts. In experiments where kittens were left without any external stimuli or play during the first weeks of life, the cats were nevertheless good hunters as adults. This means that some hunting skills are instinctive in cats and perhaps genetically coded. Normally hunting stills are continually reinforced throughout the cat’s life whether by practice stalking and attacks on a passing human’s feet, or by catching a toy mouse in the house or a real one in the garden. It is unfortunately not true that only hungry cats actively hunt. As many farmers have discovered, well-fed cats are much better 'pest controllers'. For better or worse, hunting is just what cats do. Why does a cat play with her prey? The assumption that a cat cruelly toys with her prey before killing it is a common misconception. To the horrified human who watches a cat killing a mouse, there does appear to be a lot of shoving, pouncing and poking involved; but appearances are deceptive. From the cat's point of view this is basic self-defence. Most animals are not harmless. Take rats and mice for example. They are desperate, and very fast and their sharp teeth can deliver a nasty bite. (You are about twenty times bigger. Fancy going face-to-face with a rat?) And don't underestimate the damage a bird's beak can do. These are after all, animals with nothing to lose. Cats kill their prey by biting through the neck to sever the spinal cord. But they need to do so safely with their short muzzles. For this to work well, the prey has to be pretty much motionless. So what appears to us to be cruel sport is, from a cat's point of view, the common-sense technique of exhausting the prey before the deadly bite. Her instincts tell the cat this is the best way to finish the job effectively with minimum risk. If she tries to rush the job, the prey is likely to escape, and she might end up injured. Why is my cat bringing live mice inside the house? There are two main reasons why a cat will do this. We have already seen that from a cat’s point of view her humans are adopted members of her community who lack essential hunting skills. So the mouse might be presented to you as a public-spirited training exercise. Your best move is to trap it as quickly as possible, and once out of the cat's approving gaze discreetly dispose of the unfortunate beast as quickly and humanely as possible. Secondly, when your cat shares a garden with other cats (and no, from the cat's perspective, it's not your garden) the cat may feel insecure after catching something. She needs to protect her prize from passing cats or other animals which may try to steal the prey from her. So she grabs her victim and and heads for the safety of indoors where she has the 'home advantage'. When she releases the prey in territory which is intimately familiar to her but strange to the prey the advantage is all on her side. Why does a strange cat leave dead animals at my front door? Sadly many domestic cats find themselves homeless for one reason or another. Most commonly this happens when the owners move and leave their cats behind. The abandoned cats will start looking for a new home to adopt. By bringing you its catch, the cat - in her eyes - is bringing a gift to test the waters. After all, if you move to a new home and the neighbours bring a plate of freshly baked cookies to welcome you to the neighbourhood, you are hardly going to reject them. In the same way, the cat hopes that its gift will break the ice and make her welcome around you. Bear in mind that until very recently, a cat which demonstrated itself to be a good mouser or ratter was quite likely to get the welcome it was looking for. It's hardly the fault of the cat that human attitudes have changed in one short generation and her instincts have not yet caught up.